Fighting rust and corrosion on your valuables is a never-ending battle. Only Bull Frog offers real breakthrough technology that has been perfected and proven in applications around the world. Bull Frog offers a wide range of products to protect your personal valuables and investments, which will help them perform at their optimal level. 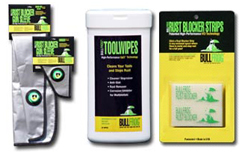 Although each Bull Frog has been created to perform a different task, each employs the same Vapor phase Corrosion Inhibitor (VpCI) Technology that has been proven to safely and effectively remove and control the ravages of rust and corrosion. ISO 9001 & ISO 14001 certified manufacturer. No nitrates, silicones, phosphates, heavy metals or harmful chemicals. Has no affect on electrical, mechanical or chemical performance and no chemical build up. 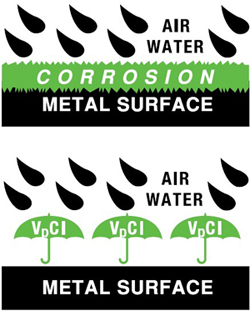 Bull Frog VpCI's bond electrochemically with metal surfaces to form a protective "Molecular Umbrella", sealing out the air and moisture that can cause rust and corrosion.